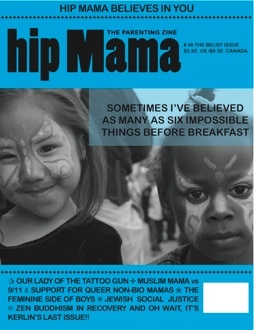 Last month this essay, which I wrote more than a year ago, was published in Hip Mama‘s Belief Issue. They wisely lopped off the bulleted list at the end, because it’s dorky to end your essay with a list. But despite the dorkiness, I still like what I was trying to convey with my list o’ beliefs, so I’m including it here. (So fun to have a blog! I get to do what I want!) If you find yourself at BookPeople or Whole Foods, check out this issue; it’s got a wide variety of perspectives on this most tricky of topics. I particularly loved “The Zen of Miscarriage” by Cheryl Dumsinil. This past weekend my husband and I took our three children to see the Our Body: The Universe Within exhibit. I was a little apprehensive about the prospect of showing a museum full of dead bodies—some chopped, stretched, and sliced—to one toddler, one preschooler, and one second-grader, but my husband was all confidence. I envisioned future nightmares, he envisioned future scientists. Thirty minutes in, my two-year-old son was making Scooby Doo–esque villian impersonations (wah ha ha!) at every skull and skeleton, and my four-year-old daughter was enthralled, high with new knowledge. But my seven-year-old son was one part creeped out, one part grossed out, and three parts troubled. I tried my best to answer his questions, even the doozies. I’ve had some practice at this; he’s been asking questions about death, meaning, and our world since he was a preschooler. But I’ve never been good at editing down answers for a younger audience, and I’m afraid my earnest attempts to clear things up served only to turn some murky waters into mud. By the time we got home, I could see he was still searching for an ANSWER that would make things right again—settle the tiny bits and pieces that had all been upended in his head. Apparently unhelped by all my vagueness, he pulled out the only set of concrete answers he’s ever been given: the Catholic doctrine he learns when he goes to visit my ex-husband’s parents. Then, before I’d even had a moment to catch my breath, he laid the big one on me: “Do you believe in God?” All day, I had been answering question after question, many giving me pause but none stopping me cold—until now. I can answer that question, but my preferred audience would be halfway into a bottle of wine and have nothing to do all night—not a 7 year old who was prepared to pay attention to my response for exactly 5 seconds. Before I could even begin, Bill Clinton–like, with “Well, it depends on what your definition of God is,” he had moved on. I had my window. And it had closed. In Bill Maher’s Religulous, he argues that the 16% of us Americans who have doubts on questions of religion should come out of the shadows and express our uncertainty without fear. Although much of his movie was too one-sided for my consensus-seeking self to enjoy, this message did strike a chord with me. It’s true, I realized—my uncertainty has left me feeling less than adequate, especially when it comes to parenting. But uncertainty is nothing to be ashamed of. These are complicated questions. I’ve thought long and hard about them, and my brain responds by producing more questions. That’s nothing to hide. In fact, when faced with as much confusion and chaos as this world serves up on a daily basis, feeling uncertain about what it all means and why we’re all here is a logical, normal response. And a humble one, too, one could argue. After all, how could any of us really know for certain the answers to life’s greatest questions? I have a friend who feels this connection. She has a relationship with God that is full of love and passion, both dear and deep. As a mother, she wants to share this passion with her children. She talks to her children about her beliefs, teaches them stories from the Bible, and displays signs of her devotion throughout her house. In some ways, I envy this in my friend. She knows what she believes in, and she can communicate it clearly to her kids. Simple. It’s just that in my head, nothing is that simple. Since that day when my son asked me the Big Question, I have made an ironic discovery. When I was forced to face my uncertainty, pull it out of the darkest recesses of my mental closet, and shake it out in the warm light of the sun, I realized that a few actual, honest-to-goodness convictions tumbled out with it. Hey, I’m not just filled with doubt! It’s just that I need to rewrite the questions. The next time my son starts in with “So who is Jesus’s father: God or Joseph?” I need to start a new paragraph. Or perhaps a new chapter. I believe that the religions of the world are human-made organizations (and so by definition both beautiful and flawed), to take part in or not as you see fit. I believe that an oh-so-very few manage to consistently see the world with open eyes, to continually experience and connect with a peace that exists all around us and within us. A handful of these people have caught the world’s attention and had religions built around them. We can learn from these people. I believe that difficulties in life are woven into the same fabric with life’s joys. Suffering and joy are intrinsic parts of living, and as a result, both will make an appearance in every life. I believe that we are not in total control of our lives. At the same time, there are many things we can control. Try your best to do what’s right with every choice you’re given, and then relax. You’ve done your part—now see where it takes you. I believe there are differences vast and many among all of us. If we were all the same, not only would our world be a much less glorious place to be, but the balance would be thrown off in a way that would benefit no one. I believe that if you go back far enough in time, we all come from the same roots. It’s so easy to see each other as enemies, but even if we aren’t aware of it, we are actually all brothers and sisters on Earth. I believe that our primary objective in life is to discover and then pursue our unique path, all while not getting too caught up in the idea of our fabulous uniqueness. A tall order indeed. But if we can pull it off, peace will be ours. My beliefs may be a little unconventional, and they are definitely too wordy to fit on a cross-stitched pillow. But that doesn’t mean I shouldn’t share my beliefs with my children. Just because I’m not taking part in one conversation, it doesn’t mean I can’t start another. And considering the complexity of these questions, I imagine it will be a conversation that will last a lifetime. New School Year, Why Are You Trying to Kill Me? Brava Amy! For many reasons, I think you should frame the cover of the magazine and hang it on the wall above your writing corner. Now off to the store where I will buy a copy and indulge in your piece a second medium. Yay!